Named after the founder’s niece, Kenna Nicole sees the world of health and beauty as a world without compromise. 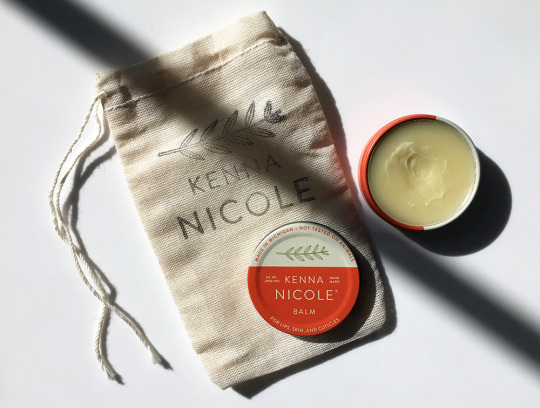 Designed with illipe butter, pure Michigan-harvest beeswax & thyme, Kenna Nicole’s Thyme Balm soothes skin, invigorates senses, heals lips and provides a sweet, earthy scent. So compact, the Thyme Balm fits easily in your pocket and transports your skin to a place of peace wherever you are. Pouch is so cute too. Bonus - Kenna Nicole also donates money from yearly sales to the Alliance For The Great Lakes, which contributes to conserving and restoring the world’s largest freshwater resource (one that’s close to home for her).